For years, I have been hopping on the dreaded 72 bus to go shopping at Stanley’s on Elston and North. Returning back to my home with bags of super cheap greens, I always have the same thought “Why the hell hasn’t anyone picked up some storefronts to liven up this area?” However, it did not occur to me that there was indeed a location that has been calling Elston Corridor its home for many years. Quite literally hidden behind the Home Depot and some sketchy looking buildings, Ada Street has been banging out eclectic and colorful food for over 3.5 years. I will admit, walking into Ada is semi creepy – you enter thru a darkened hallway lit by candlelight. To the right, there’s a translucent room hidden by darkened drapes and glass doors. However, once you are greeted and walked thru the dark hallway to the back of the space, all of the eeriness melts away. Hearing old-school vinyl record music played overhead and immediately seeing an “inside/outside” patio, its apparent that Ada Street’s concept is made to be secluded, but for good reason. Working with Eater and other food publications over the years, I’ve heard nothing but amazing things coming from this kitchen. However, I was intrigued on trying Ada’s new menu especially after its well-known head chef, Zoe Schor passed on the baton to her sous, fellow Southsider (and TWENTY FOUR year old) Joanna Stachon. Besides being impressed that a girl from my “hood” AND in her early wonder years is head chef of a fantastic location, I was definitely feeling Joanna’s menu vibes my entire visit. 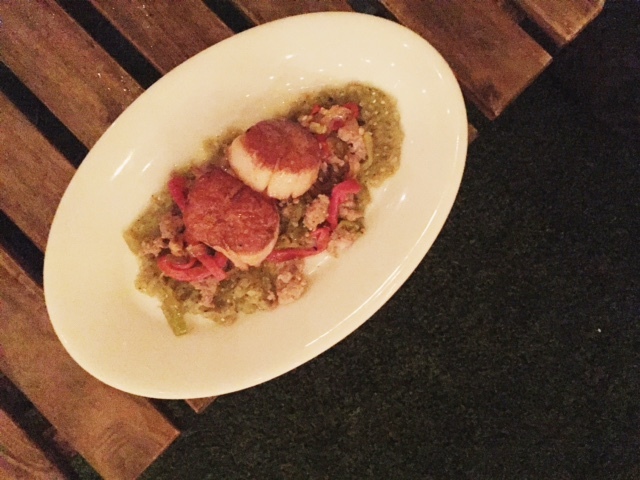 Take her pan-seared diver scallops for example. Made to resemble her version of “sausage and peppers,” chef manages to shake up the ingredients of a well-known dish and transform it into something that is more interesting than the original. 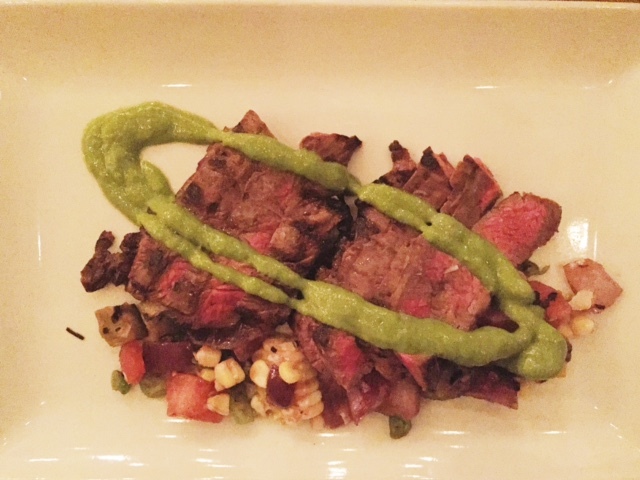 Another menu winner is her prime flat iron steak. By incorporating different vegetables based on seasonality (when I visited Ada for this article, the summer vegetables were just wrapping up), this dish is perfect to enjoy at any time of the year. Currently for the fall menu, this gorgeously grilled piece of beef sits on a bed of spaghetti squash, blistered cherry tomatoes, drizzled with brown butter, and oregano. Until recently, I’ve never been into ordering desserts. However (I swear my taste buds are changing each year I age), I’ve been learning to appreciate the many flavors of sweets each time I dine out. 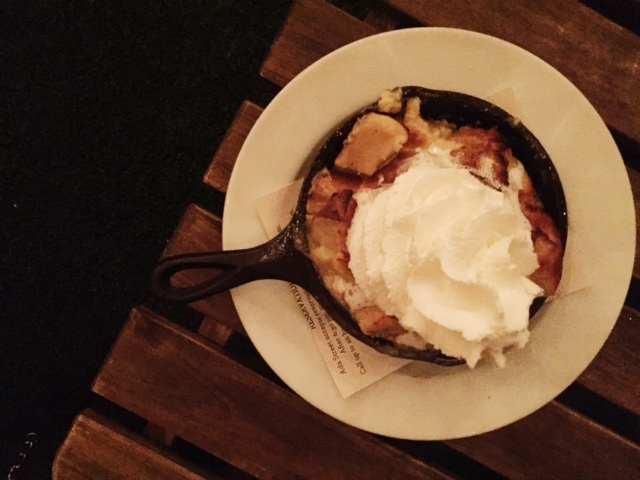 To help counter being too sugar coma’d, I try to order the good old “salty and sweet” types of desserts – and Chef Joanna’s pretzel bread pudding is just the dish that marries those two flavors perfectly. I have no shame admitting that I legit licked the cast iron plate clean. Don’t get my wrong, I love food (clearly) and I will always choose food over all. However, the one item that remains extremely unique and a frontrunner was Ada’s line of sparkling, bottled cocktails. Although not mass produced or sold outside of its walls, it definitely should be. Each cocktail is made daily in-house and then bottled for perfection. 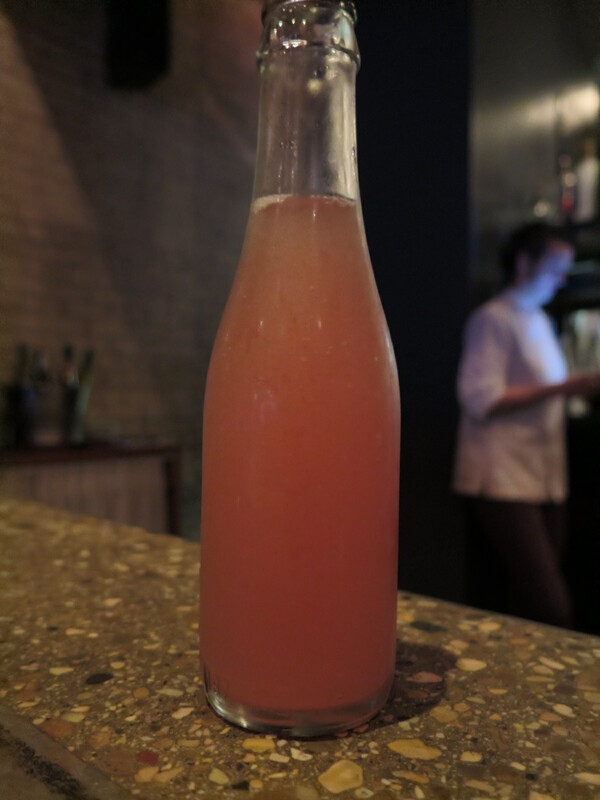 My favorite of the bunch was the “killing floor.” Made with jalepeno-infused lunazul tequila, watermelon, and lime, this drink gave me a moderately spicy kick finished with bubbles. A perfect way to finish off or kick off your experience at Ada. Next Post What’s the Buzz (Bait) in Old Town?